Spring is near and while many people are busy getting their boats and swimsuits ready, 35 million Americans are scrambling to stock up on allergy medicine. One of the most bothersome allergy symptoms in women is dark circles just underneath the eyes. Read on as Marla Ahlgrimm discusses ways women can combat coughing, congestion, and other common complaints, including under-eye puffiness. Q: Why are allergies a problem in the spring? Marla Ahlgrimm: During the early warm months of March and April, all of winter’s dormant foliage makes its yearly debut. With this spectacular showing of color comes pollen, which is responsible for the majority of allergy symptoms through the end of fall. Q: What are allergic shiners? Marla Ahlgrimm: Allergic shiners are those bothersome dark circles many women experience more than half the year. Nearly 80% of women with allergies don’t realize these dark circles are symptoms. Thankfully, they are and allergies are completely treatable. A simple test can determine an individual’s trigger(s) and they can receive treatment accordingly. This is good news for women, as allergy-related dark circles will go away with proper medication. Q: How can allergies affect a woman’s quality of life? Marla Ahlgrimm: Allergies, like the common cold, can make it difficult to breathe. Many women cough through the night and have trouble staying awake and focusing the next day. Q: When should a woman consider allergy testing and treatment? Marla Ahlgrimm: Allergies may be lifelong or they can pop up suddenly without warning. Anyone who suspects their recurrent symptoms are triggered by a change in seasons should consult their doctor. 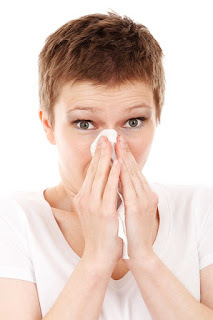 Allergy treatment is fairly simple and typically only requires the use of decongestants or antihistamines.